In today’s Ultrabook- and MacBook Air–obsessed world, you’d be forgiven for thinking that heavy, hulking desktop replacements no longer have any role to play. But Asus’s Republic of Gamers G750JH is here to prove you wrong. 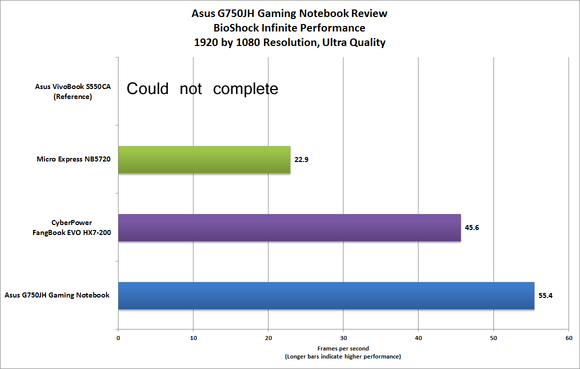 Can your Ultrabook deliver excellent performance and top-quality audio, and pump out 55.4 frames per second on a game like Bioshock Infinite (at 1920 by 1080 resolution, with visual quality set to Ultra)? No it can’t. Does your Ultrabook sport a 1TB HDD, a 256GB SSD, and a Blu-ray optical drive? I didn’t think so. Does it weigh 10 pounds (not including the 2-pound power brick)? Well...no system is perfect. The Asus G750JH is more than four times as fast as our baseline system, and only the Micro Express NB5720 gaming laptop outperformed it. This gaming powerhouse comes with everything you need and more. 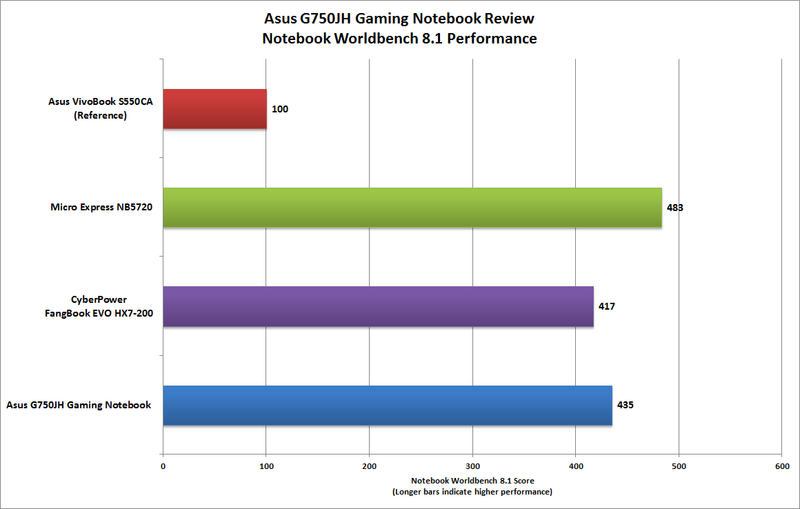 The G750JH earned a mark of 435 on our WorldBench 8.1 test suite, which means that it is more than four times as fast as our baseline model, an Asus VivoBook S550CA. 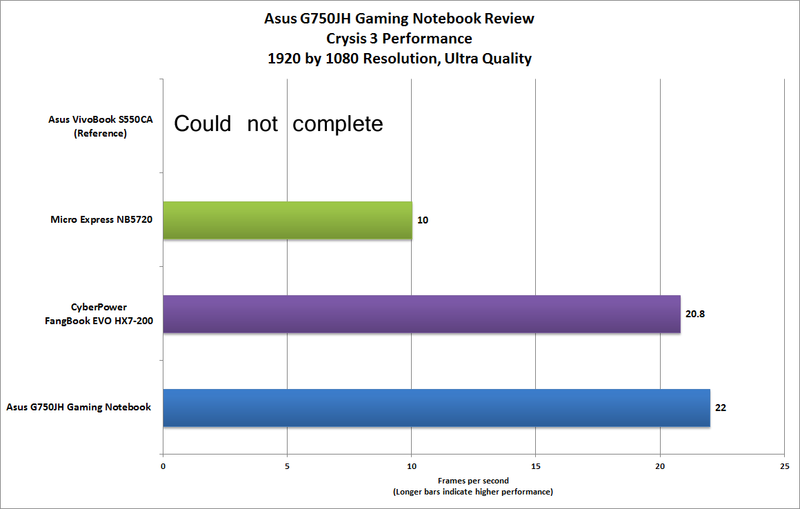 It’s also the second-fastest laptop we’ve ever tested, losing out only to the similarly equipped Micro Express NB5720 gaming machine. 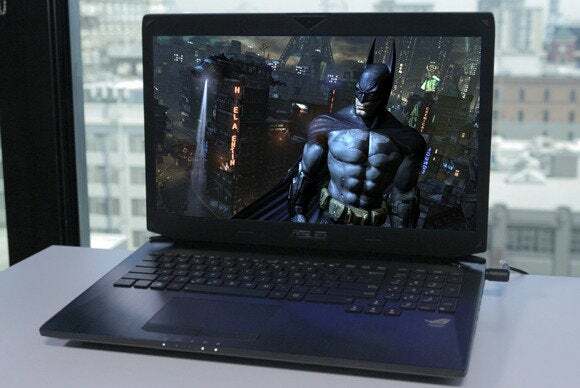 The G750JH’s ultrafast performance is attributable in part to its powerful components, which include a fourth-generation Intel Core i7-4700HQ processor, 16GB of DDR3 RAM, and Nvidia’s best mobile graphics processor: the GeForce GTX 780M. The system’s 256GB SSD helps it start up in a speedy 7.3 seconds. That’s crazy-fast for a gaming laptop—the NB5720 takes twice as long to boot. The only thing that’s too fast about this system is its battery life, which ends after just 3.5 hours. 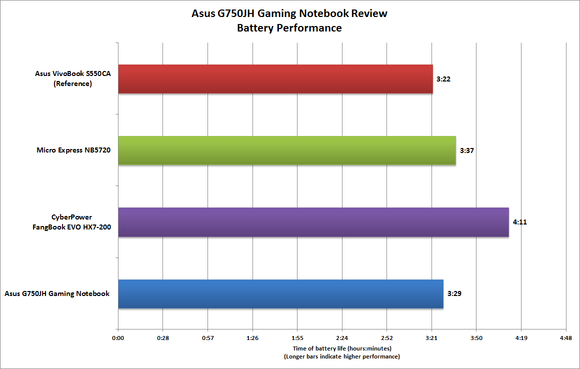 The G750JH's 3.5-hour battery life is one of the laptop's few shortcomings. The G750JH also has some features that you might not think to ask for, but that you’ll be glad Asus included—like built-in Wi-Fi (802.11a/c), Thunderbolt 1.0 support, a Blu-ray drive, and even a built-in headphone amplifier. It also has a roomy, full-size keyboard complete with an embedded numeric keypad and a large touchpad with discrete, physical buttons. The matte-finish screen is a spacious 17.3 inches wide diagonally and offers bright, crystal-clear graphics. It’s not a touchscreen, which isn’t surprising for a gaming-oriented machine but is a little disappointing considering all the cool Windows 8 features. As you might expect, the G750JH delivers top-notch graphics performance. Thanks to its discrete graphics card, the laptop plays everything smoothly, from Dirt Showdown at Low quality and 1024 by 768 resolution (122.9 fps) to BioShock Infinite at Ultra quality and 1920 by 1080 resolution (55.4 fps). Gamers, rejoice: The G750JH can successfully tackle practically any game at some level of visual quality (though it probably would have trouble with a quad-monitor setup at Ultra quality). ...and BioShock Infinite also yielded to its raw power. Though you’d never mistake it for a sleek Ultrabook, the G750JH is a reasonably attractive machine for a desktop replacement. The system is housed in a matte-black chassis with a soft, angled cover. The cover does pick up greasy fingerprints, but as long as you refrain from eating potato chips at the keyboard, you should be fine. The keyboard is large and easy to type on, and it feels solid; yet it’s fairly quiet when you’re typing quickly. The trackpad is acceptable, but most gamers will probably opt for an external mouse just for the feel of it. The G750JH enhances its immersive gaming experience with impressive speakers, which provide a good bass range and full sound. If you use headphones, you’ll appreciate the headphone amplifier, which will help plunge you in the middle of the on-screen action. An Ultrabook it's not, but if you're looking for a powerful, portable gaming rig, this Haswell-powered Asus G750JH delivers the goods.